When their alarm pagers went off around 2 am PDT last night, most seismologists on the West Coast feared the worst. 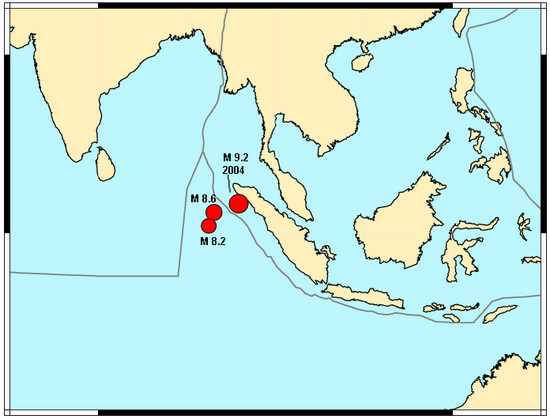 A magnitude 8.6 earthquake had struck the very area off the coast of the Indonesian island of Sumatra that had suffered extreme damage by the now infamous Boxing Day earthquake on December 26, 2004. Then, hundreds of thousands of people were swept away by one of the biggest tsunamis in recent centuries. This monster wave was caused by a giant magnitude 9.2 earthquake. Although somewhat smaller, last night's magnitude 8.6 quake could have set off a similarly strong tsunami. Adding to the anxiety was the fact that about two hours after the first temblor, a second very strong earthquake shook almost the same area. It had a magnitude of 8.2. But after a few hours of anxious waiting, seismologists and emergency responders could relax. Only a small wave less than 3 feet high hit the west coast of Sumatra. It caused no significant damage. Along the shores of the rest of Indian Ocean just a few sensitive tidal stations registered a small disturbance. Why did these two very strong earthquakes last night spare us a natural disaster similar to those that we witnessed after the 2004 Indonesia earthquake, or after the Tohoku quake, which struck in March of last year along the east coast of Japan, with a magnitude of 9.0? The differences in magnitude can not have been the only reason, because any offshore quake with a magnitude of more than 7.5 is potentially able to cause a tsunami. With their magnitudes of 8.6 and 8.2, last night's quakes were certainly within the tsunamogenic range and each one by itself could have generated a devastating tsunami. One possible explanation for the tameness of the most recent quakes is their location. Both temblors occurred under the sea floor more than 60 miles to the southwest of the epicenter of the 2004 quake. This epicenter lay very close to the deep ocean trench, which represents the boundary line between the Indian Ocean and the Eurasian plates. 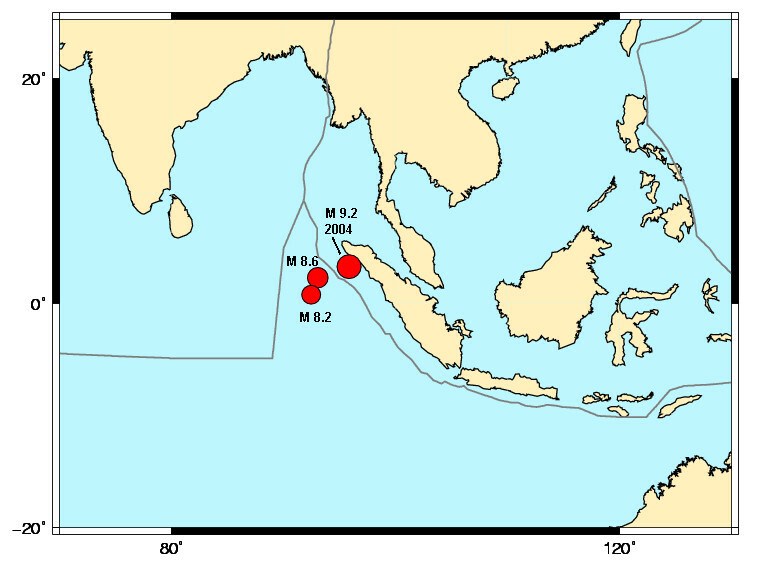 Last night's quakes were much further from the trench and thereby further from Sumatra's coastline. But as we have seen again and again, distance is no protector from the devastating effects of a tsunami. These waves can cross an ocean basin with the speed of a jetliner and are able to wreak havoc thousands of miles away from their source. The actual reason why the last two quakes did not generate any tsunami is their focal mechanism. Seismologists use this term to describe the relative direction in which the two rock masses actually move when they spring past each other in an earthquake. Take the temblors on our doorstep for example: Their mechanism is called strike slip, because our two home plates, the North American and the Pacific plates, scrape past each other horizontally. This results in quakes in which the two sides of the fault slip past each other without much vertical movement.